Ford Transit Flat with a Farriers Workshop. 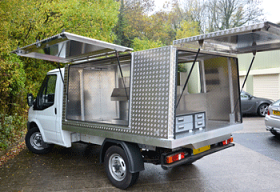 N & J Aluminium Linings Ltd has over 30 years' experience in aluminium fabrication. 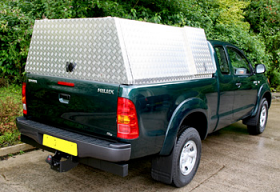 We are market leaders in the design and manufacture of 4 x 4 Vehicle Aluminium Accessories, from one-piece fully welded drop-in aluminium pickup linings, to aluminium hinged top covers and bespoke aluminium storage boxes. Our research and development begin as soon as new pickup trucks reach the forecourts. 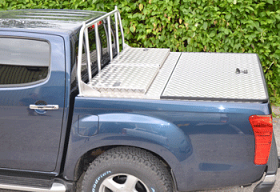 Shortly after, our range of bespoke aluminium linings and aluminium vehicle accessories are available for sale. All our aluminium accessories are manufactured in the UK at our factory in the North West of England. Our team of dedicated craftsmen use their skills, knowledge and experiences to produce a whole range of accessories for 4 x 4 vehicles. Whether you require an off-the-shelf 4 x 4 aluminium accessory or a cost-effective, more bespoke solution, we are confident we can cater to your needs. If you're travelling from a distance, we can fit your aluminium accessories while you wait. Simply arrange an appointment, then drive away your finished vehicle! N & J Aluminium Linings has successful contracts with large fleets and 4 x 4 dealerships throughout the UK and Europe. If you have a trade or wholesale enquiry, please call Nick or Julia on 01200 429955.